Wednesday featured the top 16 in the Men’s open draw battling for eight quarterfinal spots. Top seeded and 9-time defending champion Paul Brady surrendered just 11 points to teenage phenom Tyler Stoffel and will face Southern California’s Vic Perez in Thursday’s round of 8. Perez won the only tiebreaker of the day, overcoming a second game lapse to defeat Abraham Montijo. David Fink and Mando Ortiz won their matches in two games to setup a quarterfinal clash and their 10th career matchup on Thursday. Sean Lenning and Charly Shanks will renew their compelling rivalry in Thursday’s third quarterfinal match, as each won convincingly on Wednesday. Shorty Ruiz defeated #7 seed Tyree Bastidas and will face his 3-Wall rival Emmett Peixoto in Thursday’s final quarterfinal match. The Women’s Open Singles will begin on Thursday, as well as the start of the Men’s Open Doubles. Live streaming on race4eight.com will be possible because of the generous donations of the USHA and WPH. Thank you! To watch the action from Los Caballeros Sports Village from Friday, June 12th through Sunday June 14th, tune into race4eight.com. 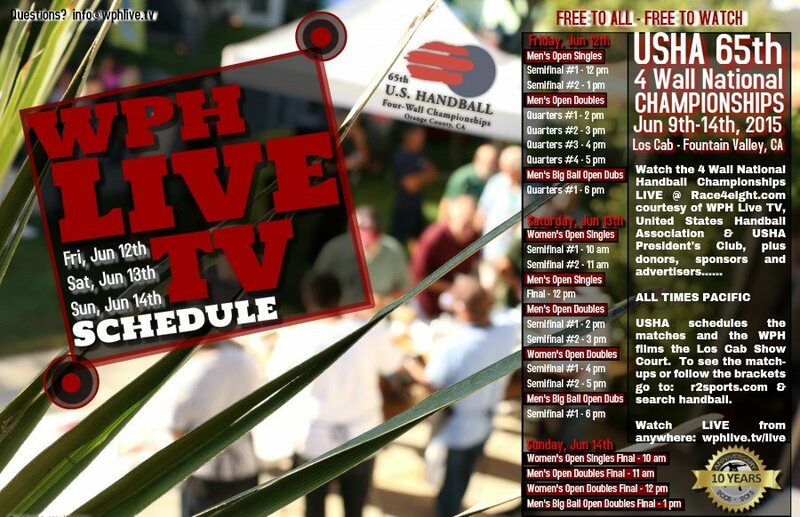 To follow the action from 65th USHA National Four-Wall Championships, log onto ushandball.org and wphlive.tv. To follow the brackets and scores, click Here.